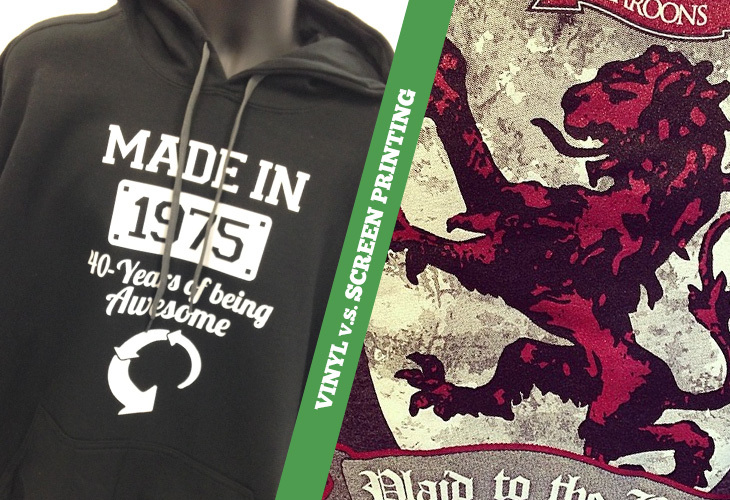 With all the talk about our new vinyl graphic capabilities and the great features they offer, I think this would be a good time to take a deeper look into the differences between vinyl and screen printing when making a t-shirt. Both options will give you a high quality, long lasting product, and in most cases either option will work just as well as the other. VINYL: Vinyl is well suited for very small runs (which we would consider anything from 1 to 12 shirts), this is because the set up time is much quicker than that of screen printing. This doesn’t make it a faster overall method though, as every shirt still requires individual set up, which becomes too time consuming beyond the 12 shirt mark. SCREEN PRINTING: Our minimum order quantity (sometimes referred to as MOQ) for screen printing is 24 shirts, as it takes much longer to setup than vinyl. Once the setup is finished though, nothing will need to change from shirt to shirt (as long as the design stays the same), making it much quicker to print larger orders. 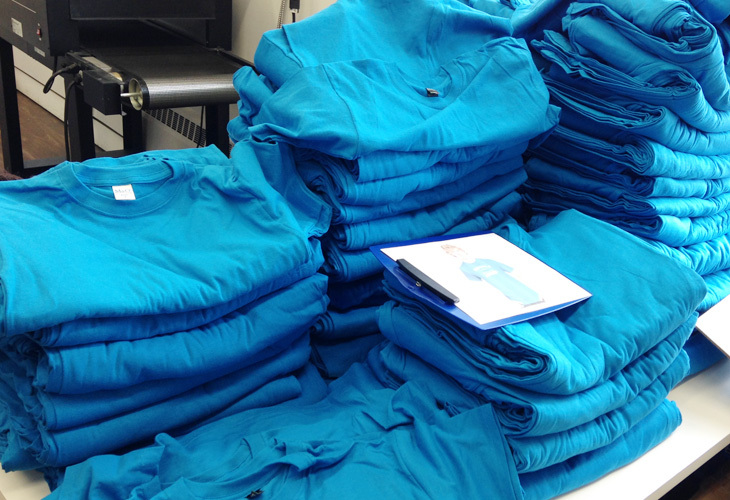 Vinyl is best suited for small runs (under 24), screen printing is more cost-effective for large runs. VINYL: Simple graphics work best with vinyl, think text based pieces, or basic shapes. Need numbers for your hockey team’s jerseys? Perfect! Want a photograph of gram-grams 101st birthday? We can promise you it just won’t turn out. There isn’t a way for us to create true gradients (think shading, or blending of colours) with vinyl and any fine details will get lost. SCREEN PRINTING: Screen printing allows for a much higher level of detail, printing photographs is possible as intricate design features will come through beautifully. You also have access to a full gamut of colours, as we can mix any shade you might like. Simple graphics work best with vinyl, while screen printing allows for a much higher level of detail. Both vinyl heat transfers and screen printed ink should last years under normal use. 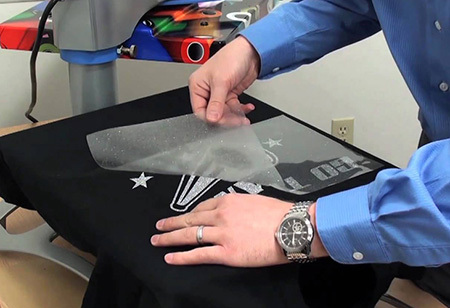 SCREEN PRINTING: Screen printed graphics should last the life of the garment under normal use. If you have any questions about our vinyl or screen printing services, or would like to receive a FREE quote, you can email us or call the shop at (506) 642-6563. I have read your nice posting. I like it very much. We are also same in this business and welcome you to visit our website. Thanks for great in formation. Both of the t shirt print ideas are good but it depends upon your choice generally. Nice Post BTW! That was very informative and helpful, thank you for the detailed descriptions of each process. Great comparison article here. Thank you for sharing. Thank you for clarity. .I guess that you can’t go wrong with either but for larger orders screen printing is best. Great Topic, However I would have like to see the same image for both. Is it possible to see the screen print on the vinyl as well. Thanks for reading AJ – glad we could help! Thanks for reading Valentin. We found the same thing – vinyl helped fill a gap in our business and we never regetted investing in the equipment. Best of luck with your business! Great article, helped me to choose between screen printing or vinyl printing for my small t shirt printing business. Thanks for reading our blog – so happy to hear we could help. Best of luck with your t-shirt printing business! Great info! You are providing the best information about vinyl and screen printing. Thanks for the great article. Can you tell me what a screen printed super bowl signed by the team be worth. Sorry Jim, I wouldn’t have any idea. I guess it depneds on who’s buying it! Can you tell me what a screen signed football by the 1996 super bowl Green Bay packers is worth? So is this picture in this article of vinyl? I kind of understand the difference, but at the same time, I don’t. Yes vinyl graphics on the left (simple shapes, 1 colour) and screen printing on the right (complex shapes, 3 colours in this example). This is an informative post. The type is based on the customer’s needs, no matter how time consuming. The customer will pay for whatever they want, whether based on your information to them, or the research that they have done personally. Thanks for the Post! Anyone looking for a software that does both of these types of printing should check out Stokkup at http://stokkup.com/ It’s got amazing reviews, and it’s really powerful. What do you feel is the most durable brand of vinyl for cotton and poly shirts? Hi Stacy, our favourite brand of vinyl is EasyWeed from Siser. Thanks for commenting!